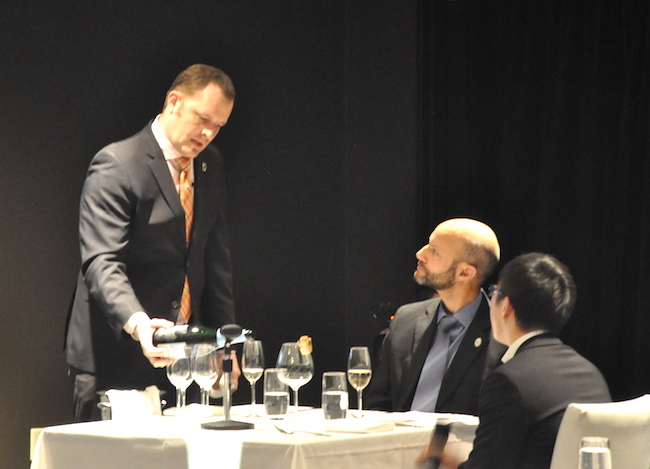 Three days after he was crowned Best Sommelier of BC, how does Alistair Veen feel? Is he still ecstatic? Still shaking his head in wonderment that he pipped a strong corps of fellow competitors? Still grinning from ear-to-ear? Yes, he is. But he’s also back at work, juggling the roles of owner, chef and sommelier at the not-so-secret gem called Tap Restaurant in South Surrey. And he was also back in his regular Wednesday morning study and tasting group (to which the three finalists belong), swirling, sniffing, and gargling wine and plotting a rigorous service exam practice schedule. Veen is affable and unassuming. He’s relaxed, confident and boy-next-door charming. Hailing from the ‘burbs (Tap Restaurant is not far from mega-stripmall Morgan Crossing) he’s not part of the elite Vancouver sommelier scene. Yes, he holds some pretty pithy wine credentials, but he toils outside the usual lustre of city fine dining. So what were his chances of winning the prestigious title Best Sommelier of BC? In Veen’s words: “I never allowed myself the thought that I could win. I was in it to learn, as I knew it was a fantastic opportunity to challenge myself.” You could say he was a dark horse, a long shot to win. And win by a mere point he did. The title Best Sommelier of BC is presented by CAPS-BC (Canadian Association of Professional Sommeliers, BC Chapter) and sponsored by the Vancouver International Wine Festival. For the rest of 2016 Veen will wear the crown (filling the deep treads of last year’s winner Jason Yamasaki of Chambar) and represent BC at the Nationals, and possibly at the Sommelier du Monde, where the finest wine palates and service aces vie for glory every three years. The principal judges were Barbara Philip MW, Michelle Bouffard, CAPS-BC President, and Sebastien Le Goff, Wine and Service Director of Cactus Restaurants. DJ Kearney was the Examination Technical Director, and the table judges were a collection of past Sommelier winners, educators and hospitality elite. Veen’s win embodied the true spirit and essence of competition: on a level playing field, anyone can win. He piped last year’s runner-up Cin Cin’s Shane Taylor, by a solo point, also besting finalist Sean Nelson of Vij’s Restaurant. Veen won the day with service flair, theory scholarship, tasting proficiency and intuitive, mouthwatering food and wine pairings. And that’s really what the art of Sommellerie is all about – beautifully served and paired wine. Go and visit Veen at Tap restaurant and see if you agree.